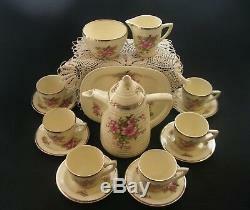 Clarice Cliff Vintage China Art Deco Rare Lynton 16 Piece Coffee Set. Cup diameter excluding handle: 6.5cms (2 5/8 ins). Cup height excluding handle: 6cms (2 3/8 ins). Saucer diameter: 11.5cms (4 1/2 ins). Sandwich Plate diameter: 19cms (7 1/2" ins) x 15cms (5 7/8" ins). 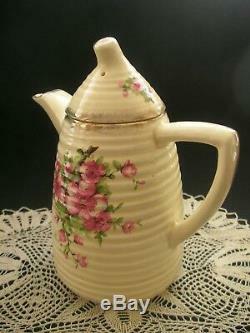 Coffee Pot Height excluding lid: 15cms (5 1/4 ins). 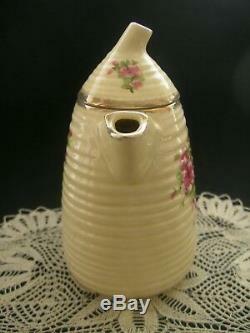 Coffee Pot length handle to spout: 16cms (6 3/8 ins). Milk Jug length handle to spout: 9cms (3 1/2 ins). 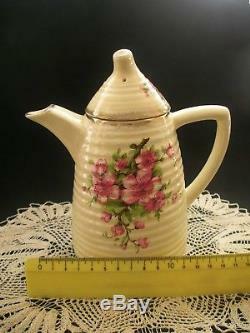 Milk Jug Height: 7cms (2 3/4 ins). Sugar Bowl diameter: 8.5cms (3 3/8 ins). 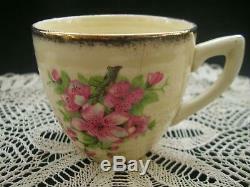 Sugar Bowl Height: 5.5cms (2 1/8 ins). 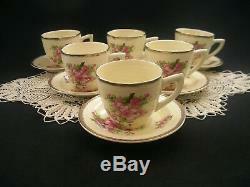 Full Clarice Cliff sets are rare and sought after by collectors worldwide. 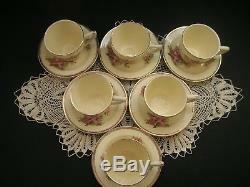 This original demitasse size set includes a coffee pot with cover, six cups and saucers, sugar bowl, milk jug and one small sandwich plate. The set has the Lynton ribbed bee hive shape and is decorated with a pink Apple Blossom pattern, front and back with speckled gold rims. Two of the cups have sustained some damage each with a fracture and an additional chip to one. A close up pic is provided of both. Otherwise all the other items are in generally excellent vintage condition commensurate for age. A couple of teeny grazes to an occasional rim here and there, but not visible, just feel with the fingertip. Age related crazing to some items, for the most part, fairly minor. No major discolouration or other damage. Some normal wear to the speckled gold rims. Overall pretty good for age even with the two damaged cups. This complete set is a rare item... Verall the coffee set presents exceptionally well... Newport Pottery Co England 818 c1930s. Wilkinson acquired the Royal Staffordshire Pottery in the 1880's. The brand is widely known as being affiliated with art deco designer Clarice Cliff. 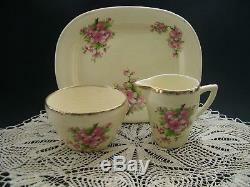 Renowned designer Clarice Cliff worked in several English factories from early to mid 1900's. She is best known for her colourful Art Deco ceramics, which include the Bizarre series, Crocus and Fantastique. 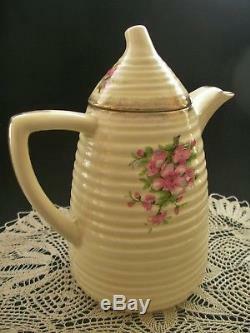 Her Art Deco wares are admired and collected worldwide and continue to fetch high prices. Please look at the photos carefully as they form part of the description. There are additional photos which can be sent to you on request or viewed on our Facebook page. Why our customers love us! Another great quality item from. Parcel registration is recommended as an optional extra. Contact Red Beards Treasure House now! Subscribe to our store newsletter to receive exclusive special offers. Australia Post Pack and Track post. All fragile items are securely packed. Please use calculator for rates to your country. We can price the following options to your country on request. 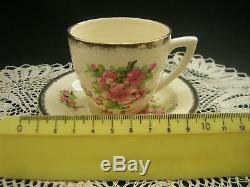 Welcome to Red Beard's Treasure House, the home of fantastic collectables, china, art, furniture and antiques. Our treasure trove is constantly growing, so check back often! 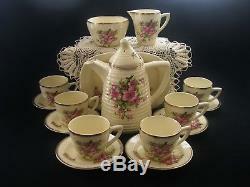 The item "Rare CLARICE CLIFF COFFEE SET Vintage Art Deco China 16 Piece Lynton Bee Hive" is in sale since Friday, March 1, 2019. 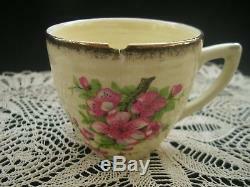 This item is in the category "Pottery, Glass\Pottery, Porcelain\Clarice Cliff". The seller is "redbeardsa1" and is located in Allambie Heights, NSW. This item can be shipped to Australia, all countries in Europe, United States, Canada, Hong Kong, New Zealand.